The Jerusalem artichoke is the tuber of a perennial plant, native to North America. Its name is probably derived from the word “Tupi”, an ethnic group of Brazilian indigenous people, some of who happened to be in France at the time of its discovery and introduction in Europe by Samuel de Champlain. The Jerusalem artichoke plant measures between 2 to 3 m in height. It bears yellow flowers that resemble the sunflower, grows easily in the wild and is so decorative that it is often used to demarcate the grounds. 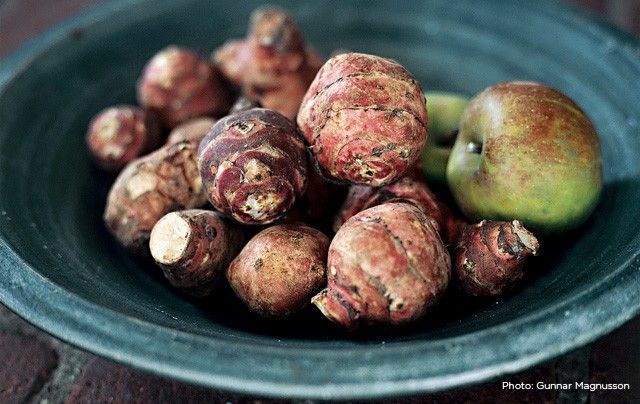 The tuber resembles a deformed potato, or a ginger root, because it is bumpy and uneven. Its yellowish white flesh is crunchy, juicy and sweetened, with a delicate taste that is similar to that of the artichoke. Its English name, “Jerusalem artichoke”, is actually the result of a bad pronunciation of the Italian word “girasole”, which means sunflower. Just like the potato, the Jerusalem artichoke was a great success at the beginning of its career, but its glory started to fade bit by bit, only to be revived during the periods of food scarcity and the wars. It is now being rediscovered as a result of its exquisite taste, and also because of its nutritional properties: It is rich in fibers and contains many vitamins and mineral salts. Moreover, as its carbohydrates are primarily in the form of inulin, which unlike starch does not have an effect on glycemia, the Jerusalem artichoke is a good alternative to potatoes for diabetics. Choose small and firm tubers, with an intact skin. Keep away from the ones with wrinkled or green tinted skin or which have started to germinate. They can be preserved for up to 2 weeks in the refrigerator. They are eaten raw or cooked. I propose them to you this week in a delicious . Originally published in the Journal de Montréal on November 1, 2008.